Season’s end is near and two teams have solidified their playoff seeding. One was expected due to their winless season, but McGrath’s Sushi was a shock since they fell to the fifth seed for the first time in team history. Clearly Moguls and Killington Resort are battling for the one seed while FSMBC and the OmyaRamas are battling for the three seed. It will make for an interesting Monday as CM takes on OR and KR takes on FSMBC, all at the same field. Donning No. 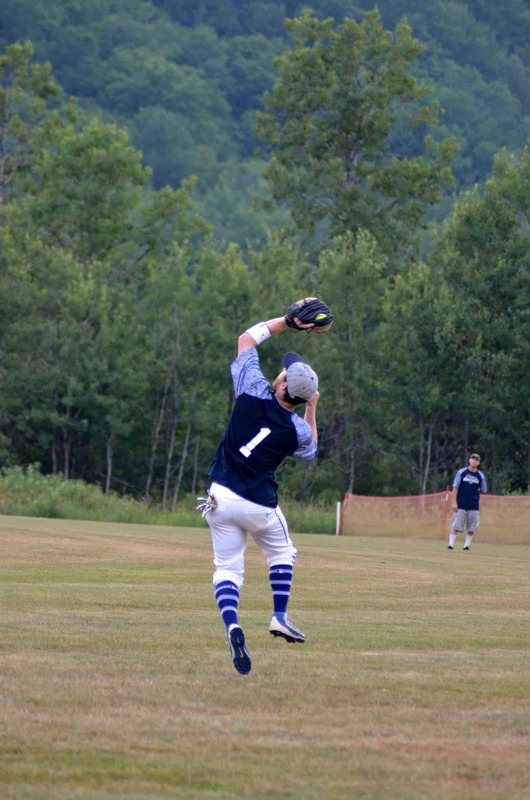 1, Clearly Moguls’ right fielder Tucker Zink jumps for a catch, while Brandon Remmick looks on. Get out the brooms because a few season sweeps took place last week. KR got a sweep of MS. The game started and ended the same for MS as they went down 1-2-3 including a “Cold Beer K” by “Bus” Bob Schaffner and Joe Montemurro, respectively. Everything in between was practically all KR as they scored 12 runs over five innings. They also scored in the “CBK” department after Mike Stoodley and Paul Blodorn each suffered one. MS could only muster up four runs. KR had a similar game against CM, but with a bigger victory. They scored in all seven innings, totaling 21 runs. They suffered two “CBKs” by the “Matts,” Peters and Kinsman. CM only got nine runs in the loss. There were home runs aplenty. KR totaled three, all in the fifth inning. Evan Anderson and Stoodley hit them back-to-back and then Blodorn added one. CM got two from Brett “The Hitman” Regimbald who has been on a home run tear as of late. “Ronzoni” Hacker had his first inside-the-park home run, but an error by the umpire negated that. Unfortunately for CM, the “CBKs” were plentiful, too. They got one each from Jeremy “Graduated to Full K” Livesey, Scott “Lay off the Lemonade” Watelet, Jesse Mike Pelland and Russell “The K Muscle” Dalglish. “Tall” Tom Gilligan added to his web gem total with a sweet over-his-head catch, robbing a home run. What was sweeter was “Ronzoni” adding a web gem on the same out as he saved the ball from going out of play, blindly grabbing the ball in mid air. KR avoided the sweep from OR and finally secured a win against them with a 15-5 victory. They had home runs from Kinsman and Chandler “KOS” Burgess, a two-run and a three-run, respectively. MS and OR had a back and forth battle with OR squeaking out the win which left MS with a losing week. It was 4-4 after one, but MS got to 8-4 until OR cut in it half, 8-6 after three innings. MS bats went cold but the OR were heating up, making it six unanswered to take a 10-8 lead. MS got two back in the top of the sixth but OR cemented the win with five in the bottom and eventually won 15-11. OR avoided a sweep from FSMBC with a close 9-6 win and then FSMBC rebounded with a close 7-3 win over the Karrtel for their only sweep of the season. CM had a double-header of sweeps. First up, they crushed the Karrtel 16-5 for sweep one. The Karrtel was wearing eye black to protect them from the sun but it almost became the opposite, black eyes from getting too heated. CM brought in Livesey to pitch and put “Ronzoni” in right. He showed the young bucks how it’s done being a wall out there, including a web gem. Judd “Fired Up” Washburn started the scoring, driving in Regimbald in the first. They made it 4-0 after “Ronzoni” and “DJ” Dave Hoffenberg combined for five RBI. Washburn blasted a three-run shot for 8-0. The Karrtel finally scored in the third and fourth. The Karrtel had some sweet “D” shutting down CM 1-2-3 in the fourth, including a web gem from Forrest Baker as he robbed “Ronzoni” of an extra-base hit. Regimbald jacked one in the fifth to add three to the total. CM was too much for the Karrtel to handle and they suffered a 16-5 loss. Regimbald was one triple away from the cycle, but still ended a perfect 3-3 with a walk, four runs scored and five RBI. Livesey pitched the complete game to stay the league’s winningest pitcher. He also delivered a “CBK” to his fellow employee, Luke Carey. CM sweep 2 was against FSMBC. “Ronzoni” went back to the mound and Livesey went back to striking out. CM took an early 5-0 lead off a three run shot by Washburn that saw Livesey with the “CBK.” Collin “Hungry Like The” Wolf got three back with a rare bases-clearing single. Tyler Lysakowski suffered his team’s first “CBK,” looking. The scoring resumed in the third with another five from CM and the “CBKs” resumed for FSMBC with one by Wyatt Mosher. Each team suffered one in the fourth with Dalglish for CM and Sam Budusky for FSMBC with the score now 11-5. Pitcher Johnny Sharpe fired up his team in the fifth when he struck out Angel Shannon. They used that momentum to score five runs in the bottom to come within one. Washburn sent another over the fence for an insurance run in the sixth and Gilligan added another with his slippery pickle move that frustrated FSMBC. Budusky joined Lysakowsky in the “CBK looking” department to add to his “CBK” total. In the end CM got the sweep by a slim 13-10 margin. Playoffs begin with games in Killington and Bridgewater at 5:50 p.m./7 p.m. July 18,There will be a post game party at McGrath’s Irish Pub at 8 p.m.